With a dual-compartment design and a zippered expansion system, the Lexington 15 has the versatility to keep pace with the most demanding business schedule. 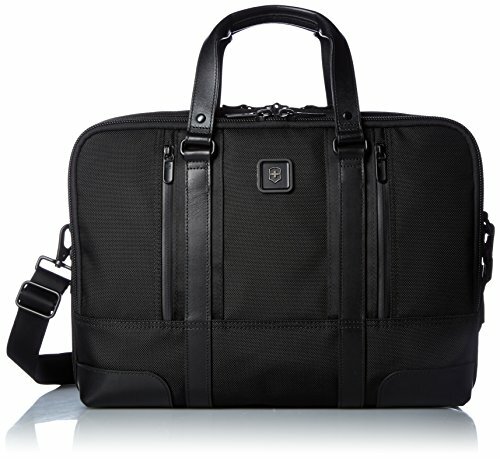 Padded compartment holds up to a 15.6" laptop, features lockable zipper sliders and contains a Swiss-engineered protection system composed of lanidur - an ultra-strong fiber. Padded tablet / ereader pocket with premium twill lining. Interior organization includes fan file dividers. Front organizational panel contains two full-length zippered pockets, electronic device pockets, business card pockets and pen loops. Exterior organization includes two quick-access front pockets and a full-length rear zippered pocket that converts to a sleeve for sliding over the handle system of wheeled luggage. Expands 5 cm (2") for additional capacity. Removable, adjustable padded shoulder strap. Water-resistant zippers on laptop and accessories compartments to protect your belongings. Custom ykk zipper pulls feature a thumb groove inspired by the Swiss army knife. Premium twill lining in select interior pockets. Leather haul handles. Swiss tracker bag tracking program will reunite you with your bag anywhere in the world should it ever be lost - for free. Global lifetime plus limited warranty.